My main ideas were to either use some sort of electromagnet to stimulate a magnet inside the body at the end of every hour. More esoterically you could stimulate it with a different frequency every hour (although I don't have an implant yet so I dunno how well you can perceive frequencies etc). My other idea was to use a thermo-electric generator, to produce a shifting heat pattern with an "N" shaped wave - so it peaks at every hour then slowly decreases till the 1/2 hour mark etc, although more experimentation into how well the ambient heat from the peak dissapates and if the body can actually notice and make a "time map" of past peaks and stuff to actually give you a passive perception of time. This is similar to something I want to do. Mine is a bit different, though. I was thinking of embedding it into my arm and using some basic electrodes to stimulate it. Every 6 seconds or so, it would pulse. The pulse would be a little different each time. Then you'd have something for minutes, and a counter for hours, and stuff. ...Yeah, I haven't thought this through very much. the N-shaped heat thing won't work out. you'll be able to sense the peak. but most senses don't give you an "absolute" value. so after a few seconds or minutes you won't really be able if it is still warm or not anymore. i'd also recommend a fully implantable version with electrodes. it's about the most basic,yet useful implant one can build that contains all major components like power supply, microcontroller ,electrode-output and communication with the device. even with only one electrode one could output a lot of useful information. like a pulse every few seconds and the full time every minute using morse-code or so. I thought about that too, but I dunno what would be the best way to interface with the body itself. I thought that just having an electrode wouldn't be enough to properly stimulate the body properly as the output could go to an number of nerves, but again I haven't had anything implanted yet. Using some sort of implant in the earlobe was another idea which I had, like a vibrating earring would generate enough force to be noticeable. What if you had this "watch" on your wrist give off electromagnetic pulses in morse code or something. Maybe it just gives of the hour and minutes, then 10 seconds off, then gives it off again. 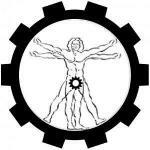 the body can't sense electromagnetic pulses. so a wristwatch giving such pulses off would have no efect. and given my just created biohacking-idea-evaluation-flowchart this would be a wearable gadget. i am all in favor of saumanahaii's idea. electrodes are pretty much the best idea to interface the body. doesn't really matter if you fire off a whole bunch of nerves, your brain won't care that much. i have no worries the brain will make sense from the input. i mean your tactile sense isn't going numb either and it's permanently active. 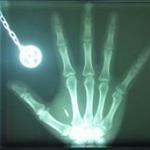 If you have a magnet in your finger, you'll detect the electromagnetic pulses. I've been wanting to build one of these myself, given how simple it should be. While I have no electronics experience, I could probably hack one together. The holdup for me is the electrode. What's the state of the biohacking art with those? Just a biocompatible metal exposed to the body? Once I figure that and power out, I could build this thing. also: nice flowchart. Probably should get that stickied. I think its unnecessarily rough on embeddable electronic doodads and gadgets, though. Hybrids of embeddable and exposed technology are quite valid, even if they aren't my cup of tea. Don't really know how well an implanted watch would work (and a little bit worried it might mess up the circadian systems going on) but I'd suggest for every idea to be tested like the compass was first made into the northpaw. I know, their goal never was an implant, but using small vibrating parts (worn on skin, not under it) to simulate direct nerv stimulation would give quite a save testing method. So one could directly test whether a certain setup actually gives a feeling of time. Also, how about some sort of binary device? There would be 12 electrodes (or so) and with each passing hour one more would "turn alive". The signal of each individual electrode being small pulses (just like with the southpaw). @ThomasEgi: Great flowchart, but it seems rather badly formatted. A bunch of the arrows are conflicting, directly recursive, or confusing, and a couple yes/no ones seem to be missing a 'yes' or a 'no' option. Also, I don't understand the implication that using Bluetooth implies "You won't see it built anytime soon." That's not the case, unless by "anytime soon" you mean "less than two months from now, assuming we can make sure it's properly bioproof before then." a typical low-power bluetooth module has an operating current demand of somewhere between 20 and 40mA (compare to the microcontroller: 10-100μA ) . this would drain the average implant-sized battery in 30 to 120minutes. it just eats too much battery. even in sleep mode they alone eat more than the entire rest of what i would say is a reasonable power demand for an implant. the flowchart is to be read with a good portion of humor. it's not intended to always provide you with an actual choice for entertainment purpose. @Ben having 12 electrodes 12x the problems and powerdemand. i'd start with one.